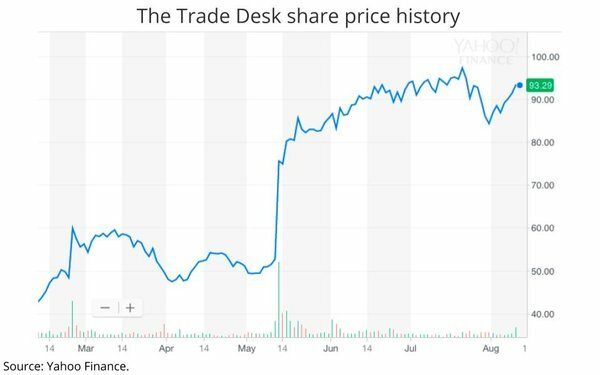 The Trade Desk, a publicly traded company that has emerged as the go-to programmatic solution for many big agencies and clients in recent years, reported strong second-quarter earnings based on increased spending from both new and existing clients, as well as international expansion. Revenues soared 54% from the same quarter last year, rising to $122.3 million, and the company’s management boosted its full-year guidance to investors by 5% for full-year 2018. Much of TTD’s expansion is coming from new and emerging programmatic markets, especially mobile (+89% for the quarter), video (+156%), and audio (+191%). Connected TV revenues more than doubled for the quarter and TTD touted a “New Wave Platform” launched during the second quarter, which includes “an artificial intelligence agent, a media-planning tool, and a “new user experience.” The company said it is seeing “good traction” from the new platform. Reactions from Wall Street securities analysts continue to be mixed, with some upgrading their price targets for TTD’s stock and others more muted. Raymond James analyst Aaron Kessler reiterated his “Outperform” recommendation and changed TTD’s share price target to $122 from a previous target of $74. Pivotal Research Group analyst Brian Wieser was more subdued. While he increased TTD’s share price target by $1 to $59, he maintained his “Sell” rating. A number of industry insiders have suggested that much of TTD’s growth has come from cutting “loss leader” deals with customers that may not be sustainable in the long-run, especially when their contracts come up for renewal. The question is whether incremental growth from new markets, platforms and customers will offset that.